Most of my favorite places on Earth possess the skill to transform anyone with a camera into Ansel Adams or David Hockney. Earth Day is every day through my cell phone lens. For instance, the photo at the top. Only one or two readers have asked, which means that perhaps many, many readers have been wondering about this in silence. It’s a clamor of silence. (In the world of a co-dependent like me, almost complete silence is the same thing as many specific requests.) The unasked question(s): The photo at the top, where is that? What is it photo of? Indeed, there is one photo on this web site that is not of me or my duck friend, and it has sat at the top of the front page since The Gad About Town made its debut three years ago. It is at the top. It is the view of the Hudson River looking south from Frederic Edwin Church‘s home studio, Olana, near Hudson, New York. 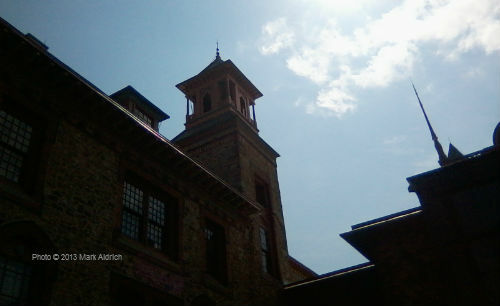 It is a photo taken in 2013. Look closely. A boat the size and shape of an oil tanker, which is probably what it is, is displacing water, silently creating a wake in the middle of the river. (One sees many tankers every day on the Hudson, from Albany south, which serves as a reminder that this body of water is a highway for humanity and has been put to continuous use for many different communities over thousands of years.) The couple of mountains seen in the haze on the right are part of the Catskill Mountains, which is also where Opus 40 sits. The clouds are … they just are. Clouds rebuff words. Frederic Edwin Church (1826–1900) was one of the major contributors to what became known as the Hudson River School of painting. This was not a school with a campus, and none of its members considered themselves to be a school; some did not even know each other, much less one another’s works. Thomas Cole (1801–1848) is considered its founder; he traveled to the Catskills and was so struck by the natural and peaceful and yet dramatic beauty that he was inspired to paint huge landscapes (wall-sized in some cases) that depict nature at its most impressive. The Catskills and the Hudson were not the only subjects; as artists traveled west along with the rest of the population, places like the Sierra Nevadas captured the artists’ gaze and were committed to canvas as well. Ruins in Greece and Italy became popular concerns, as well. The Hudson River artists rendered the exotic commonplace and the commonplace (often weather events) exotic. And Frederic Church wanted to live amidst the commonplace pastoral splendor of the Hudson Valley, but he wanted to live and work in a mansion/studio that was fairy-tale exotic, like a building in a Hudson River School painting of Persia or Turkey. This was the Romantic Era in literature; Church’s home is something out of Coleridge. 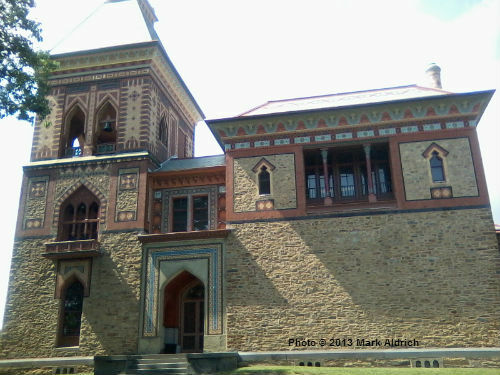 Olana, a portion of the south side. Click for full size. The photo above was taken right after I took the photo of the river view; these windows are the windows that gave Church approximately the view that I look at each day that I write a new piece for The Gad About Town. The inside is as exotic as the outside, as Church had learned about wall stenciling and tiling with different materials. No one has quite captured in words what he created. Is it “Persian-Moorish-Eclectic” or “Italianate-Eastern-Picturesque,” as art encyclopedias attempt to name it? It is exotic, fanciful, a dream house, and yet it is homey, “cosy,” as he called it. Seen from the distance, as someone standing on that distant tanker on the Hudson might, it does not stick out like a piece of tomfoolery, evidence of one man’s ego, surrounded by the otherwise placid green splendor of the Hudson Valley hillsides. On the contrary, it enhances the greenness. And not even 50 years ago, it was almost lost to commercial developers. Church’s wife Isabel died in 1899, he died in 1900, and their son inherited the property. He and his wife farmed the property for decades. When she died in 1964, one of her nephews inherited it, and he attempted to put it up for public auction. A campaign to save it, which Life magazine reported about, followed. New York State interceded and purchased it in 1966. Thus, it is now a state park, so parking and walking around the grounds during the day is free, and tours of the inside of the mansion itself costs $12/adults, $10/seniors, $10/students with valid ID, free/children under 12. In the shadow of Olana. Click for full size. This is an edited version of a piece from June 2015. The WordPress Daily Prompt for April 22 asks us to reflect on the word, “Earth,” for Earth Day. Ironic that Mr. Church’s house looks like a medieval church. So gorgeous. Beautiful photos and a beautiful place. I’m lucky that I have had the chance to visit that area a bit in the past. I didn’t know about the history of the area. Your post was very enjoyable to read.